Top expert and new treatment pioneer, Dr. Alan J. Bauman, discusses new, effective treatments for the estimated 80 million Americans facing hair loss as part of National Hair Loss Awareness Month campaign. Boca Raton, FL–August is all about Sun, Fun, BBQ’s and…Hair Loss? Since an estimated 80 million Americans, (50M men/ 30M women), experience some level of hair loss, National Hair Loss Awareness Month effectively shifts the focus on prevention and effective treatments to reduce these startling (and treatable) statistics. 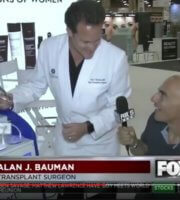 Internationally Recognized Hair Loss Expert Dr. Alan J. Bauman aka the “Boca Hair Doc,” will be performing LIVE in-person hair loss Q+A’s and evaluations including HairCheck® measurements, a non-invasive method to scientifically measure hair loss and hair growth, a vital step in maintaining, enhancing and restoring each individuals living and growing tresses. This special Hair Loss Awareness Month event will take place at the Hairatin® Kiosk at the Sawgrass Mills Mall on Saturday Aug 18th (which is being dubbed Super Sat-HAIR-day or #SatHAIRday) from 12-4pm. “Hair” you will find a convenient Hair Loss Awareness Month “Cheat Sheet” to hold onto the hair you have and learn about treatments to consider if/when you start to lose your strands. Awareness and taking early action are essential in improving the odds that your hair will be with you in the best condition possible for as long as possible. 1) A common mistake with detecting hair loss is to rely on the “mirror test” before taking action. This type of visual assessment puts you at a disadvantage because by the time hair loss is visible half of your hair in that area may be already gone. Research shows that most people who have undergone treatment for hair loss wish they started sooner. 2) HairCheck®: New measurement and evaluation tools abound. Hair Restoration Physicians MDs can help accurately diagnose, measure and monitor your condition. 3) A family history of hair loss, over-styling and use of harsh chemicals, illness, stress, certain medications, smoking and poor diet can all impact hair health and influence hair loss. Experts advise eliminating as many hair loss risk factors as possible. 4) Don’t wait to take action to reduce your risk of further hair loss. There are non-invasive therapies that can be implemented and, if need be, more intensive yet minimally invasive procedures that can help thinning, balding and overall hair density on the scalp. 5) Don’t be fooled by elixirs and “miracle hair-growth cures.” Hair restoration is a clinically recognized medical sub-specialty so working with someone who is properly credentialed, experienced and has positive reviews is the smartest route to pursue. Compounded Formula 82F Topical Finasteride + Minoxidil – designed to reduce the risk of side-effects from oral finasteride (Propecia). Low Level Laser Therapy – FDA-approved drug-free hair regrowth with LaserCap 224, CapillusRX 312 devices for at-home use. 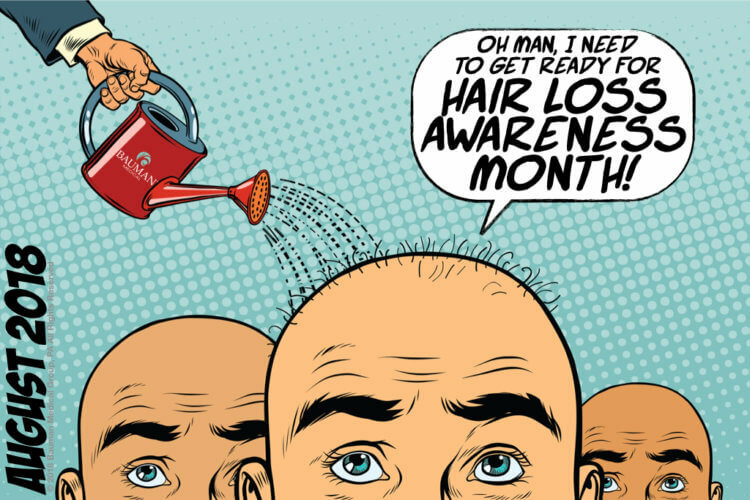 Hair Loss Awareness Month “Take-Home Message:” Assembling the right information, acting upon it at the right time and working with a bona-fide hair restoration and treatment physician when it comes to hair maintenance, restoration and treatment can make all the difference. 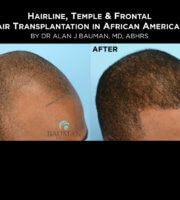 To learn more please visit, www.BaumanMedical.com or www.bocahairdoc.com or call 561-394-0024. For media inquiries, please contact Danna@canpublicity.com.